"The magical adventure begun in The Bear and the Nightingale continues as brave Vasya, now a young woman, is forced to choose between marriage or life in a convent and instead flees her home—but soon finds herself called upon to help defend the city of Moscow when it comes under siege. Orphaned and cast out as a witch by her village, Vasya’s options are few: resign herself to life in a convent, or allow her older sister to make her a match with a Moscovite prince. Both doom her to life in a tower, cut off from the vast world she longs to explore. So instead she chooses adventure, disguising herself as a boy and riding her horse into the woods. When a battle with some bandits who have been terrorizing the countryside earns her the admiration of the Grand Prince of Moscow, she must carefully guard the secret of her gender to remain in his good graces—even as she realizes his kingdom is under threat from mysterious forces only she will be able to stop." The Winternight Trilogy has so far been captivating in a way that I find hard to explain. I wasn't planning to pick up The Girl in the Tower just yet, but it was an incredibly rainy day (a rare occasion where I live) and it just called to me and left me with this mad desire to start reading it because it's perfect for cold, dark days. Before I knew it, I was fully enraptured in Arden's storytelling and never wanted to leave it. 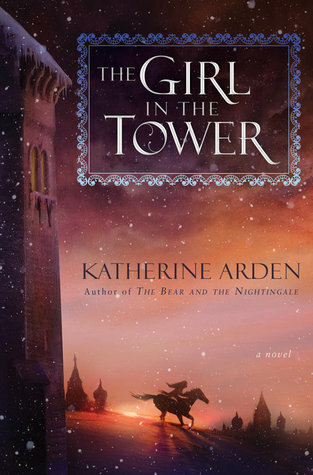 The fairy tale atmosphere is just as strong in The Girl in the Tower as it was when Arden first created in the first book, and the Russian setting and influence is simply gorgeous. I was really impressed by how much Arden was able to fit into this book without it ever feeling slightly overwhelming. I also love how Arden sort of mixes in folktales and fairy tales elements with some more realistic historical elements, which in turns makes the world feel fully fleshed out and full of intrigue. There's always something going on somewhere. Vasya grew a lot as a character in the first book, but it's this book where Vasya truly discovers more about who she is and who she wants to be. She still struggles immensely--if not more--with not knowing where she belongs or what she should be doing. She was born a girl and therefore in line to follow the traditional female roles in life, but she refuses to be forced into a woman's role and would much rather live the life that men are allowed to live. I think Arden conveyed this struggle so well and really allows the reader to understand Vasya and her motivations for her actions. She's one of those characters that I genuinely love and care about. She's strong and powerful, but she's still discovering those things about herself and what to do with them. She has a lot of determination, but she's also a bit reckless and it definitely gets her into trouble sometimes; a lot of times her recklessness has a purpose, but sometimes she just can't seem to say no to a challenge and I felt that was a very realistic portrayal of someone who is constantly trying to prove herself. There are many other characters in this book that bring the sequel to life, some old and some new. Morozko, the Frost Demon, plays a prominent role in this book as well and I find him to be such a fascinating character and one of my favorites. He has so many internal struggles that tend to make him hard to deal with for Vasya and especially closed off to others--which makes sense, given what he is. I really hope that we get to explore more about him in the next book. Vasya's brother Aleksander wasn't quite as endearing as I'd remembered from the first book, but at the same time I can understand why he acted the way he did in certain instances. I also enjoyed seeing Olga again and I loved her daughter, Mara. It was nice to return to some of Vasya's family members and have a bit of a reunion, even if it didn't go quite as well as we might all have hoped. As much as I love Vasya, I have to say that I might love her horse Solovey just a little bit more. I love horses and think they are some of the most beautiful creatures, so I pretty much lived for every scene with Solovey, as he is truly a remarkable animal with a fantastic personality. He is just as much a developed character as the others and I love his and Vasya's connection. I also really like Morozko's horse, but we don't get to see her quite as much. I don't know if Arden has been around horses much or just does good research, but her depictions of the horses, how they act, how they move, how they trust--all of it was wonderful. There is so much to take away from The Girl in the Tower, from trying to figure your place in the world when you don't quite any molds to showcasing the differences in how male and female roles are put into place to simply learning how to survive. This is a beautiful, wintry book that is endlessly enchanting and will keep you on the edge of your seat the entire way through. Overall, I've given The Girl in the Tower a well-deserved five stars! I cannot wait to jump into The Winter of the Witch next. Yay, I'm so glad you loved this book too! The last installment is amazing as well.